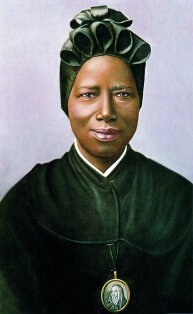 Saint Josephine Bakhita - My Catholic Life! Black-on-black or Arab-on-black slavery normally preceded and made possible the white-on-black slavery practiced by the colonial powers. These powers—England, France, Spain, Portugal, Italy—were not slave societies, but their colonies were. The complex, pancultural reality of the slave trade and of slavery itself was on full display in the dramatic early life of today’s saint. The future Josephine was born in Western Sudan, centuries after the Church and most Catholic nations had long since outlawed slavery. Enforcing such teachings and laws was infinitely more difficult, however, than issuing them. And so it happened that a little African girl was kidnapped by Arab slave traders, forced to walk six hundred miles barefoot, and sold and resold in local slave markets over a period of twelve years. She was forcibly converted from her native religion to Islam, was cruelly treated by one master after another, was whipped, tattooed, scarred, and beaten. After experiencing all the humiliations inherent to captivity, she was bought by an Italian diplomat. She had been too young, and it had been too long, so she did not know her own name and had unclear recollections of where her family would be. She, essentially, had no people. The slave traders had given her the Arabic name Bakhita, “The Fortunate,” and the name stuck. Living with limited freedom as a maid with her new family, Bakhita first learned what it meant to be treated like a child of God. No chains, no lashes, no threats, no hunger. She was surrounded by the love and warmth of normal family life. When her new family was returning to Italy, she asked to accompany them, thus beginning the long second half of her life’s story. Bakhita settled with a different family near Venice and and became the nanny for their daughter. When the parents had to tend to overseas business, Bakhita and the daughter were put in the care of the nuns of a local convent. 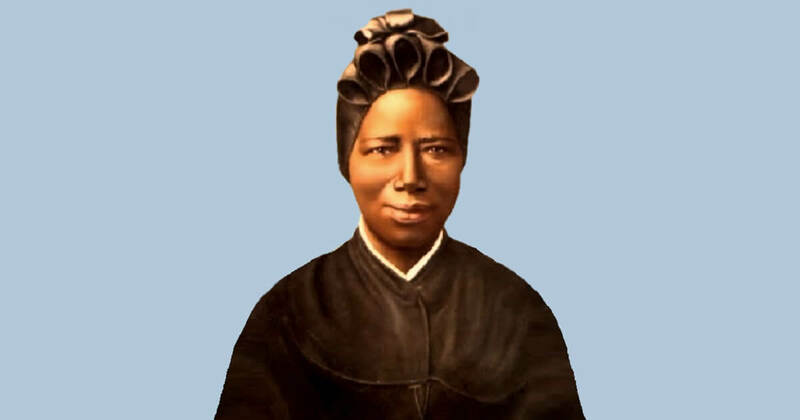 Bakhita was so edified by the sisters’ example of prayer and charity that when her family returned to take her home, she refused to leave the convent, a decision reaffirmed by an Italian court which determined she had never legally been a slave in the first place. Bakhita was now absolutely free. “Freedom from” exists to make “freedom for” possible, and once free from obligations to her family, Bakhita chose to be free for service to God and her religious order. She freely chose poverty, chastity, and obedience. She freely chose not to be free. Bakhita took the name Josephine and was baptized, confirmed, and received First Holy Communion on the same day from the Cardinal Patriarch of Venice, Giuseppe Sarto, the future Pope Saint Pius X. The same future saint received her religious vows a few years later. Saints know saints. The trajectory of Sister Josephine’s life was now settled. She would remain a nun until her death. Throughout her life, Sister Josephine would often kiss the baptismal font, grateful that in its holy water she became a child of God. Her religious duties were humble—cooking, sewing, and greeting visitors. For a few years she travelled to other communities of her order to share her remarkable story and to prepare younger sisters for service in Africa. One nun commented that “her mind was always on God, but her heart in Africa.” Her humility, sweetness, and simple joy were infectious, and she became well known for her closeness to God. After heroically enduring a painful illness, she died with the words “Our Lady, Our Lady” on her lips. Her process began in 1959 and she was canonized by Pope Saint John Paul II in 2000. Saint Josephine, you lost your freedom when young and gave it away when an adult, showing that freedom is not the goal but the pathway to serving the Master of all. From your place in heaven, give hope to those enduring the indignity of physical slavery and to those bound tightly by other chains.